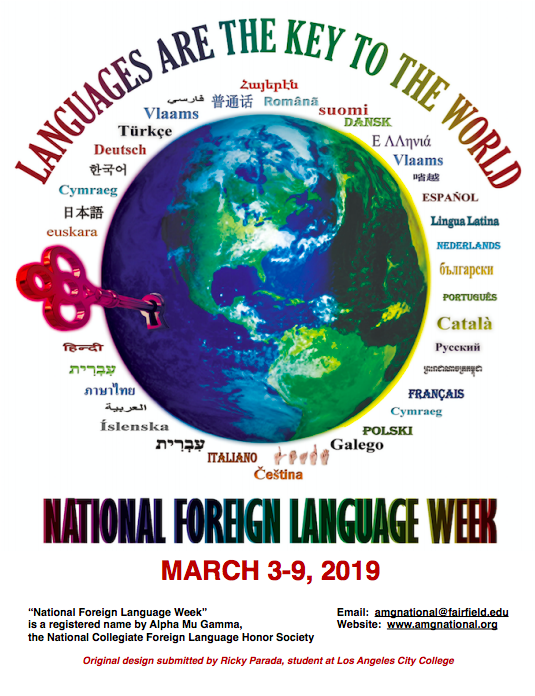 National Foreign Language Week was inaugurated in the Spring of 1957 by Alpha Mu Gamma. Sister Eloise Therese, the National President of Alpha Mu Gamma from 1956 to 1960, discovered that such a week had never been officially celebrated in the United States as a whole, although foreign language had receive recognition by different educational institutions at various periods of the academic year. Inspired by her the National Executive Council of Alpha Mu Gamma began to formulate plans to make the United States aware of the need for and importance of foreign language study through the celebration of NFLW. The first celebration was set for the week of February 17 to 23, 1957. Each year since then the National Executive Council of AMG has set a week for this event. In recent years it has become the practice to have NFLW during the first full week of March. On December 12, 1956, President Dwight D. Eisenhower sent a telegram endorsing the celebration, and each succeeding president has added his support. An even greater contribution to the success of NFLW was made by the posters of the late Bruce Russell, who received not only the Pulitzer Prize but also recognition from President Eisenhower for his efforts toward greater world understanding through his timely cartoons. He offered the Society a cartoon each year until his death in 1963, and even left one finished drawing and an unfinished sketch that were used in 1964 and 1966 respectively. These posters have been distributed each year throughout the United States and are available for sale to interested bodies. The chapters of Alpha Mu Gamma, now spread through over forty states, took the initiative in organizing activities during the Week with the purpose of making the American student aware of the vital necessity for foreign language study. Typical projects were newspaper articles, radio and television programs, foreign language films, festivals of foreign music and plays, the singing of foreign songs and lectures open to the public. Soon other universities, colleges and schools were also celebrating NFLW. Every year a NFLW poster with a new theme is printed. It is distributed free to all AMG chapters and is available for sale to the public. Normally the posters size is 24"x19", and are printed in two versions - one with the official date for the Week and one without. The cost, at present, per poster is $6 and shipping & handling is $6 (for 1-5 posters). Shipping is free for orders of 25 posters and above. They are mailed out in solid mailing tube by US Priority Mail.